Robert Amer is excited to be back with St. Petersburg Opera once again for The Tales of Hoffmann. 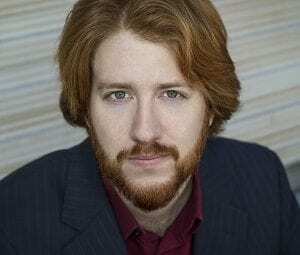 As a participant in over fifteen productions with SPO, the company has been integral in the young singer’s development, immersing him in repertoire staples such as Tosca, The Barber of Seville, and Carmen, among many others. Robert has also received training at USF, the Nei Stëmmen International Summer Academy in Luxembourg, Miami Music Festival, and Sherrill Milnes’ VOICExperience program in Savannah. Earlier this season, he sang in the chorus for SPO’s production of Il trovatore, and on the other side of the bay he participated in Opera Tampa’s productions of Roméo et Juliette, La cenerentola, and Tosca, in addition to Anton Coppola’s Centennial Celebration. A native of South Florida, Robert began singing in a heavy metal cover band with his friends when he was fourteen and joined his high school choir two years later. The path from Metallica and Pantera to Mozart and Puccini brought him to USF, where he was encouraged by his voice teacher, Dr. Won Cho, to pursue a career as an operatic singer during his freshman year. Next season he plans on staying in the Tampa Bay Area, teaching and singing as much as he can. He currently studies with Dr. Robyn Rocklein (who’s covering the role of the Voice of Antonia’s Mother in this production).